The legendary "Fighting 69th” took part in five major engagements during World War I. It served in the front lines for almost 170 days, suffering hundreds killed and thousands wounded. Unfortunately, due to sales rights restrictions, we cannot offer Duffy's War for sale in your country. The legendary "Fighting 69th” took part in five major engagements during World War I. It served in the front lines for almost 170 days, suffering hundreds killed and thousands wounded. This highly decorated unit was inspired by its chaplain, the famous Father Francis Duffy (whose statue stands in Times Square), and commanded by the future leader of the OSS (predecessor of the CIA), "Wild Bill” Donovan. One of its casualties was the poet Joyce Kilmer. Due in large part to the classic 1940 movie The Fighting 69th, starring James Cagney and Pat O'Brien (as Duffy), the unit still has strong name recognition. But until now, no one has recounted in detail the full story of this famous Irish outfit in World War I. The exciting Duffy's War brings to life the men's blue-collar neighborhoods—Irish mostly and Italian and overwhelmingly Catholic. These boys came from the East Side, the West Side, Hell's Kitchen, the Gashouse, and Five Points; from Brooklyn, Queens, Long Island City, and Staten Island; and from Father Duffy's own parish in the Bronx. They streamed out of the tenements and apartment houses, enlisting en masse. Brothers joined up, oftentimes three and four from one family. 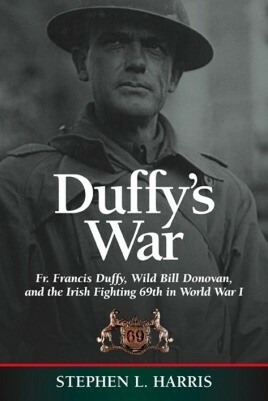 Published during a resurgent interest in the doughboy experience of World War I, Duffy's War also tells the fascinating history of New York City and the Irish experience in America. With this book, Stephen L. Harris completes his outstanding trilogy on New York National Guard regiments in World War I. "If you want to get a real feeling for what is so often called the American Experience in World War One you could do little better than read the classic trilogy by Stephen L. Harris, of which Duffy's War is the final volume...although the book is 379 pages of solid history based on numerous sources, Duffy's War reads like an exciting historical novel as it moves along with countless details and insights and vividly brings major actions and characters to the forefront."